Londolozi - All Good Things must come to an End. The question of course is how it should end? Waking early today is really easy. The anticipation of even more bush action makes rising an absolute pleasure. However, the rain is back again. 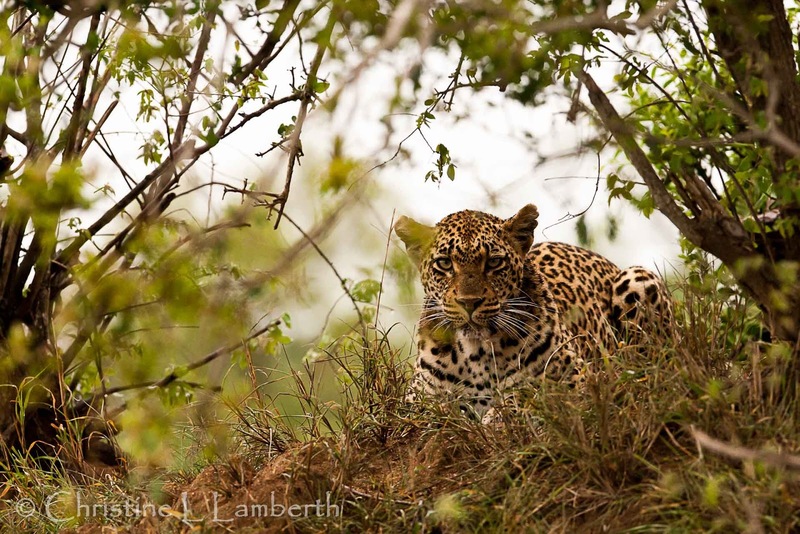 A gentle mist has settled over the Sabi Sands Reserve. Our smiling faces belie the obvious challenges of travelling on an open vehicle with rather sensitive camera gear. Using blankets and ponchos, we wrap everything up tightly and head out. 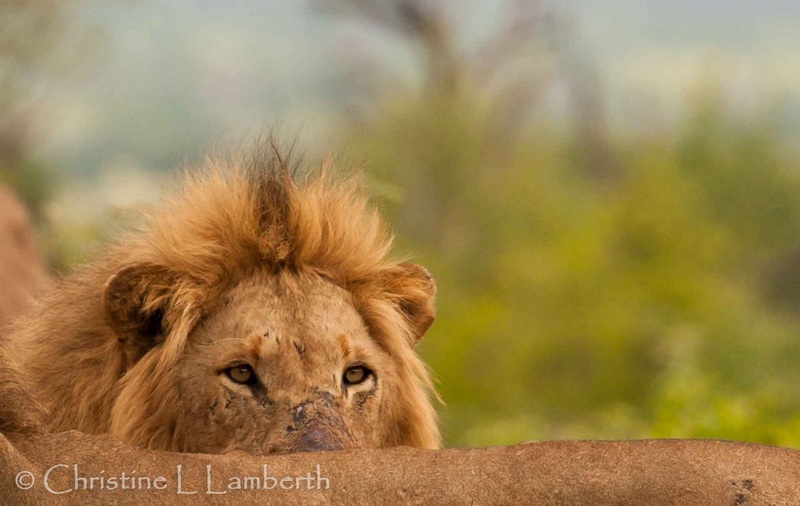 This time we head out West of the Lodge and we are looking for a pride of Lionesses that have brand new cubs. A sudden shout from Geoffrey our tracker brings the vehicle to a stop. He points off to the right into a sea of long grass. We scour the bush desperately screwing up our eyes and only after he literally takes out his ruler and pointer can we see what it is that has him so excited. 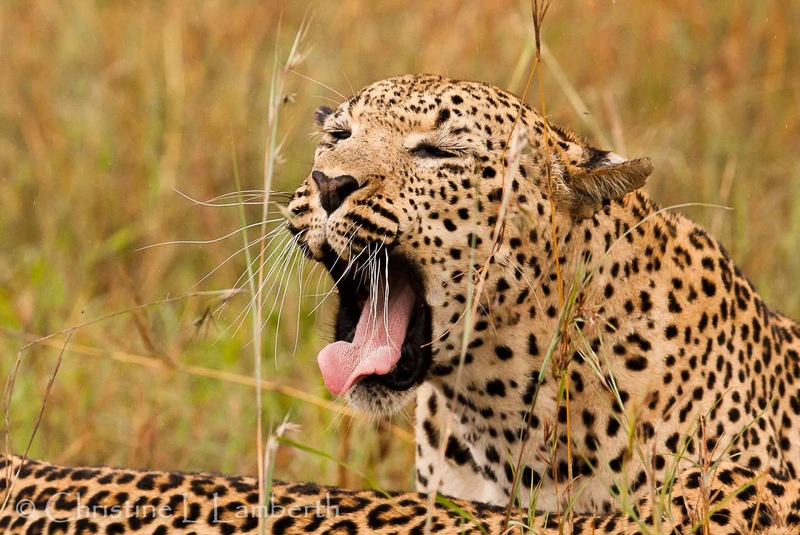 The tiniest tip of a Leopard’s ears. It is the mating couple. They are far from where they were last night. It is astounding that he managed to see this tiny little movement of an ear flicking in the grass. This is the advantage of having a top tracker on your vehicle. You get to see all that the bush has to offer. A quick about turn brings us to the mating pair who have obviously been very busy all night. A picture paints a thousand words and so I will simply let the images speak for themselves. We spend the whole morning still available to us watching, photographing and simply revelling in the wonder that is the African bush. 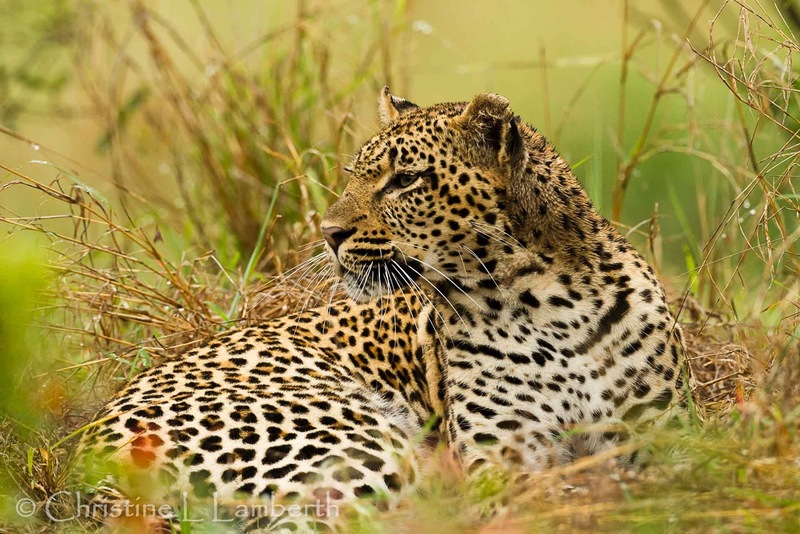 It is indeed an amazing experience to be able to spend such a long time with not one, but two, Leopards who have no interest in going somewhere else. During the proceedings the Camp Pan Male gets up and disappears into a warthog burrow that is carved into the side of a termite mound. 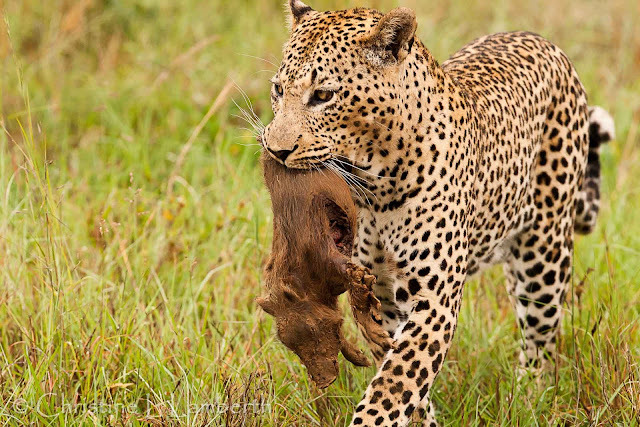 He emerges with a baby warthog that is very obviously quite dead. He settles himself very comfortably off to one side and proceeds to eat his breakfast. He does not share with the female who sits and glares moodily at him. After a couple of hours nature calls and we head off for a coffee break. It is time to do a last bit of video work for Londolozi and then the rain sets in. 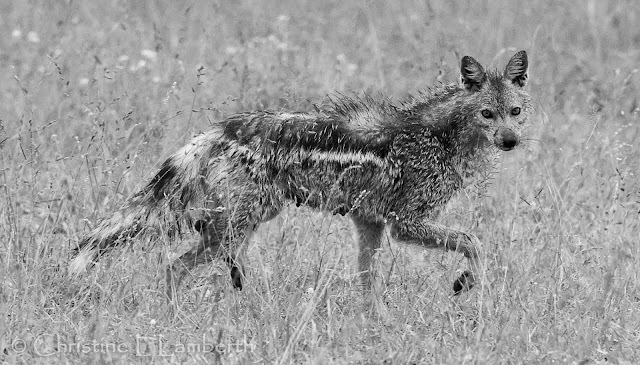 We head back to the camp and have a quick sighting of a side striped Jackal and her two new pups. Reluctantly we have to leave. This has been an awe inspiring experience and I am not sure that the bush can ever give up so much again in so little time. The divine brunch prepared by the Sorceress in the kitchens of Tree Camp at Londolozi goes down a treat. 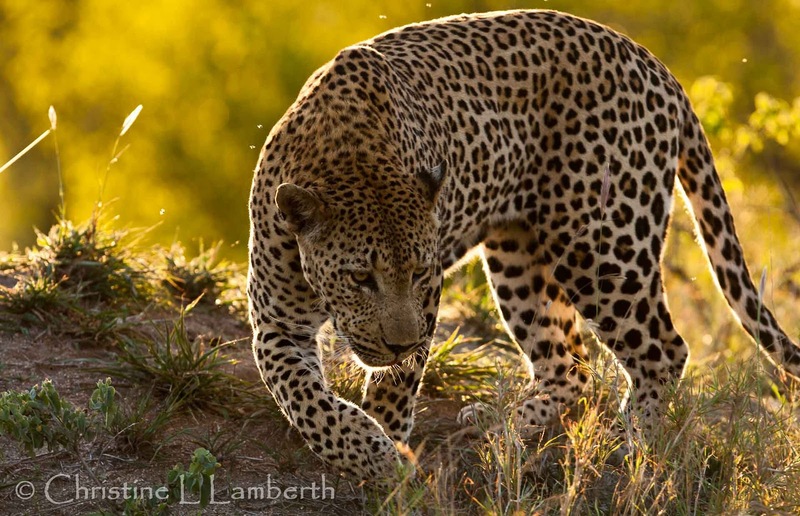 Then it’s off to our heavenly “chateau” – you can’t call the digs at Londolozi “rooms” – it is tantamount to an insult to the glorious luxury in which we are ensconced between the game drives. After a quick spit and polish and a short 40 winks it is time to head off again. The rain has lifted slightly and although there is still cloud cover the quality of the light is encouraging. Decision made we head back to the Lion sighting of the morning. 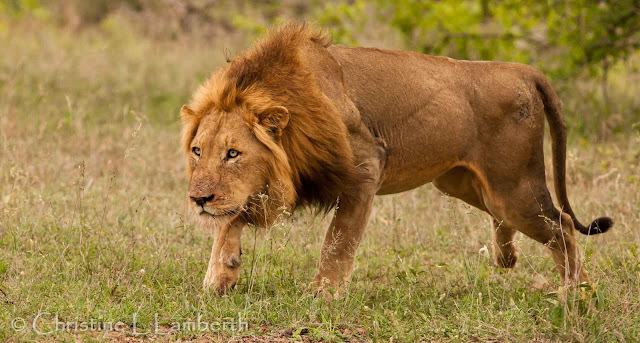 More likely than not, the Lions will have found the unfortunate Wildebeest as the Vultures had been gathering when we left the sighting earlier. 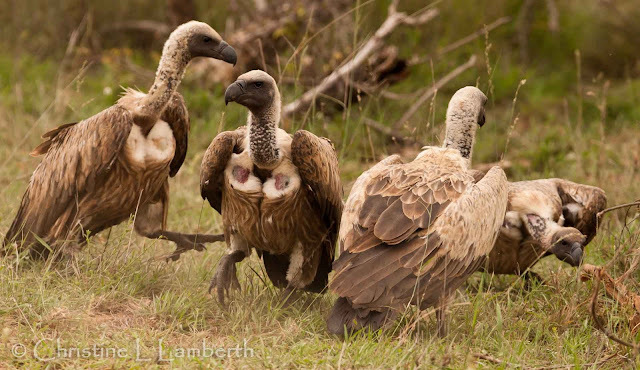 From a distance we can already see the circling Vultures. As we near the sighting the presence of the birds of doom is overwhelming. They adorn every tree and bush while there is an ominous gathering taking place on the ground. 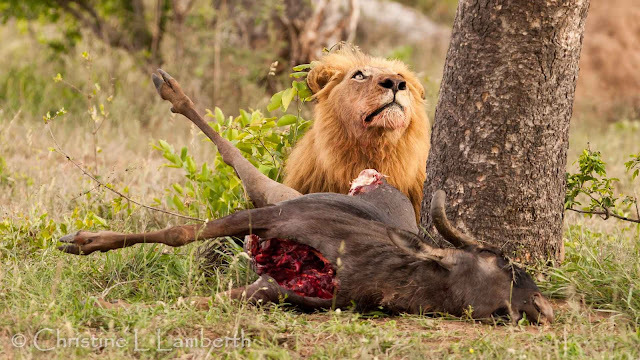 The Wildebeest is no more and one of the coalition Lions is jealously guarding the carcass. Another Lion has taken the unborn calf. We park the vehicle and as the engine dies the sound is replaced by that of bone being snapped and crushed. This is an opportunistic kill and the three boys are not sharing. The Hooded Vultures are surprisingly brave. 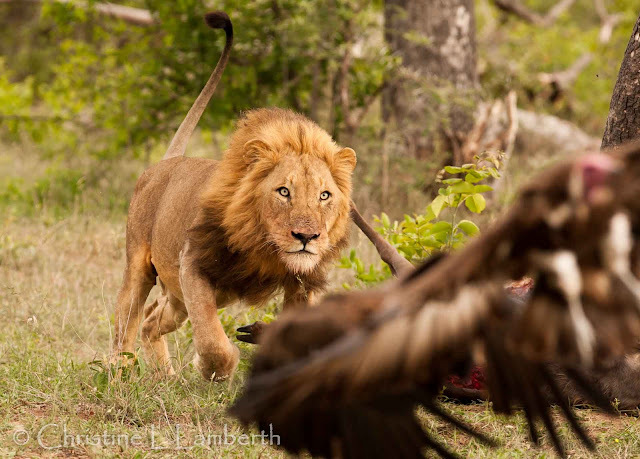 They creep up behind the Lion preoccupied with his fresh kill and slyly peck at the abandoned bits and pieces lying on the ground. 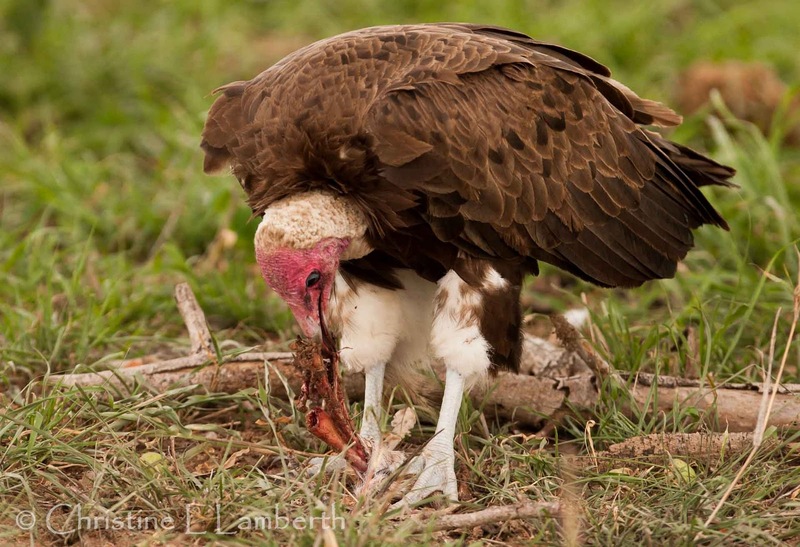 Vulture action around a fresh kill is some of the best action a photographer can hope to get. The constant ebb and flow of movement as birds fly in and land, hiss and bite at each other and vie for the best position on the kill can keep a lens and shutter occupied for hours. 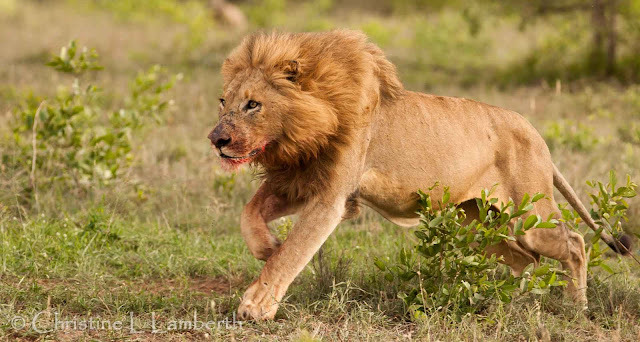 At this sighting however, we have the added bonus of three snarling Lions who are not giving an inch. I am a Lion and I am listening to the flapping wings of each little bird as it flies by, I can hear the huge wings of each vulture as it lands and I can hear every vehicle from far, far away. No, I am not flying off in lalaland. I am wearing the earphones connected to the sound equipment on the Super Vehicle. What a revelation. The magnified sound gives me an inkling of what animals can hear. The cacophony that reverberates in my head is astounding. Each footfall, each chirp and whistle, each grunt can be heard. It is like entering a new domain, a parallel universe where senses are transported to unbelievable heights. 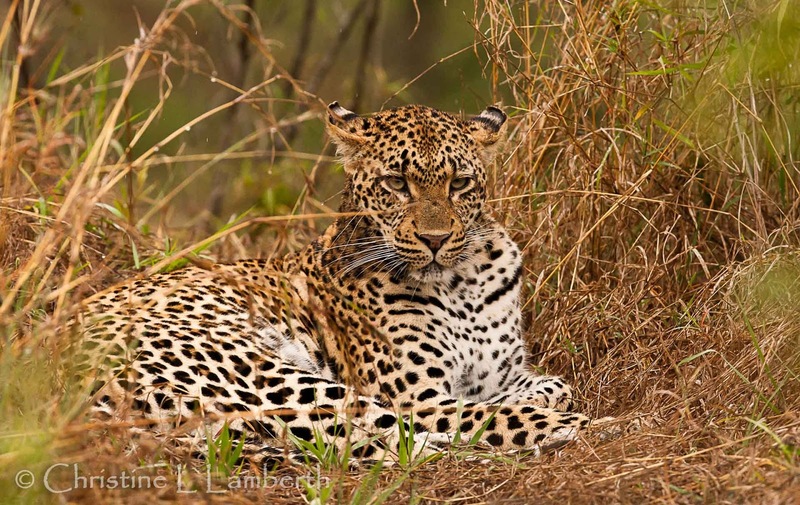 It is a spiritual moment granted to those who partake of the African Bush. All too soon and while the action is still all around us we get a call that a male Leopard has been robbed of his kill and is sitting in a tree. 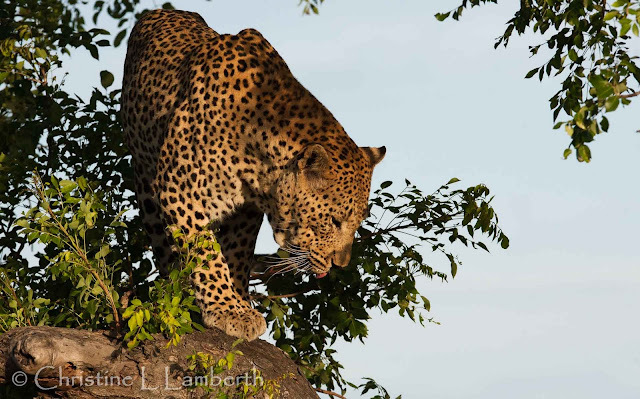 A great temptation that cannot be resisted, we leave to head off to the second treed Leopard of the day. 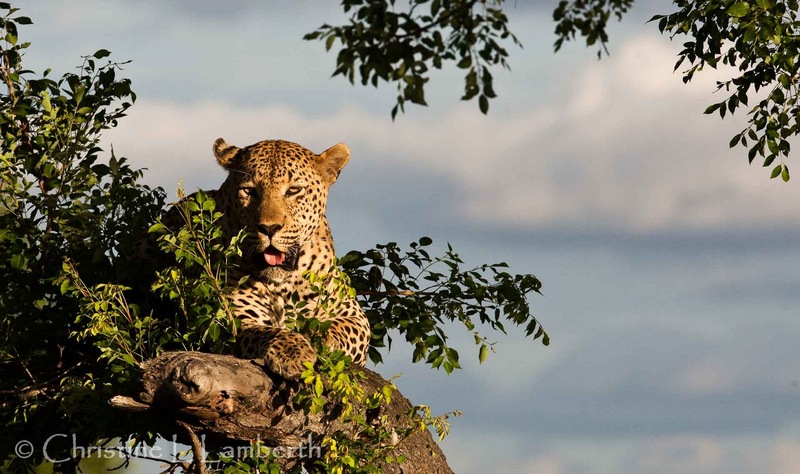 We approach and the sky clears above our heads and we have glorious golden light, a Leopard in a tree and all is right with the world. 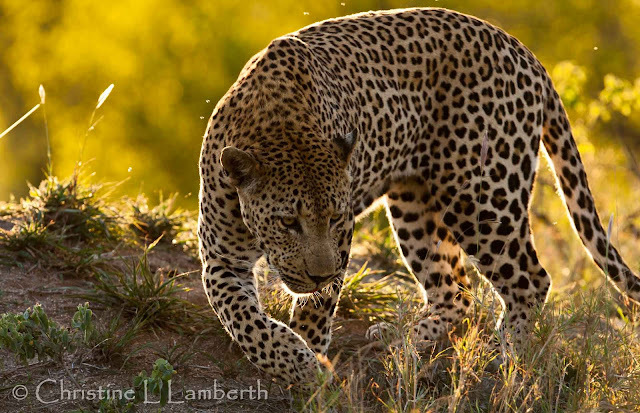 It is not too long before the Leopard feels safe again and he starts moving off. We follow. We drive through trees and over bumps, grass and bush. 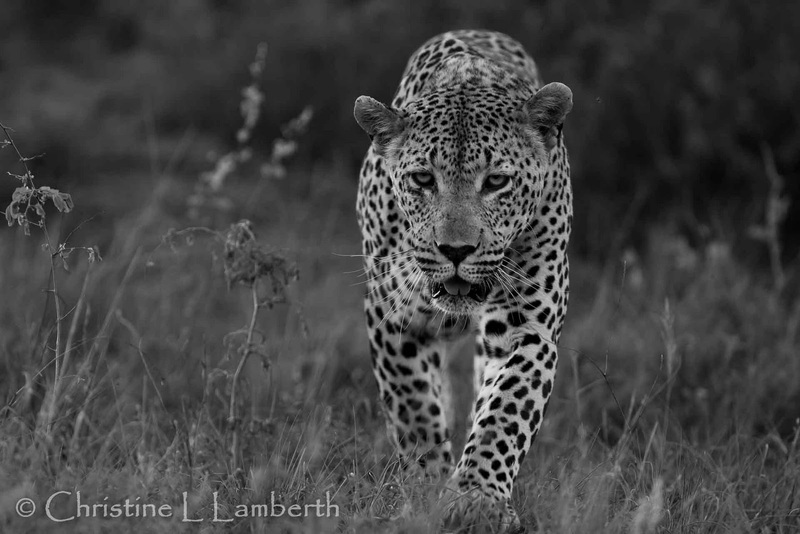 Never say a Landrover can’t go where a Leopard goes. This Landrover is not called a Puma for nothing. The Holy Grail of the African Savannah. 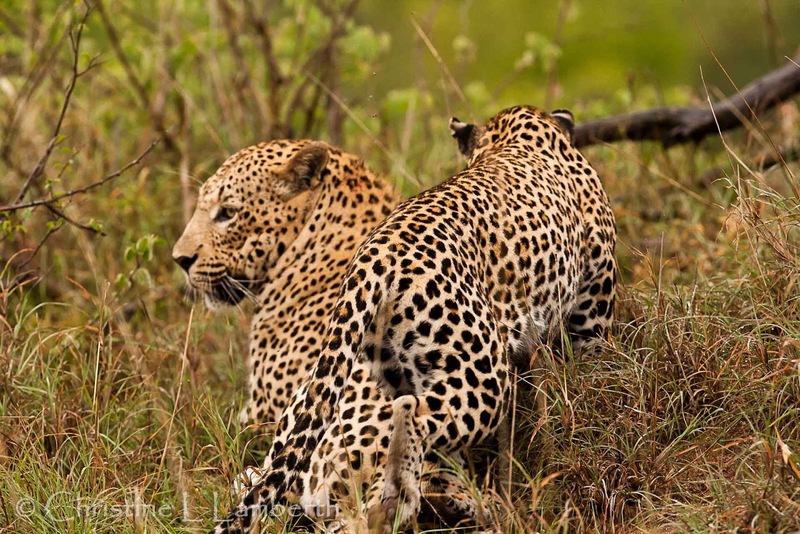 We get word that a female Leopard is tracking the male. The excitement is now tangible and I am sure that the grin on my face looks completely ludicrous. 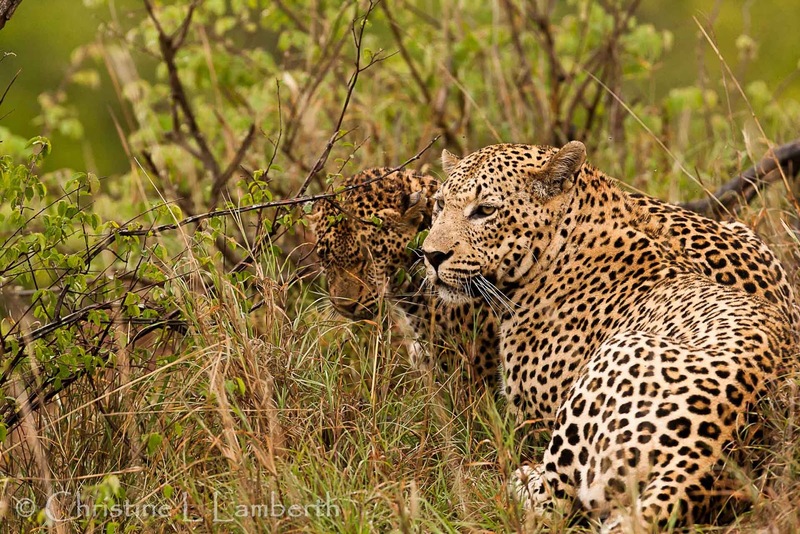 It is only a short time before the female catches up to the male. She circles around the male completely ignoring our vehicles and within seconds she approaches. 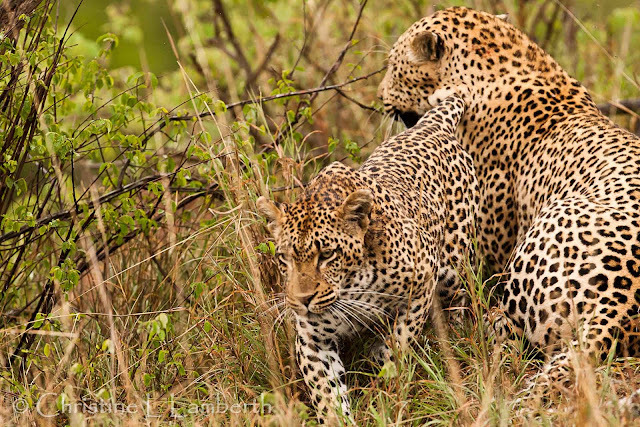 I am astounded at how aggressive a Leopard mating is. 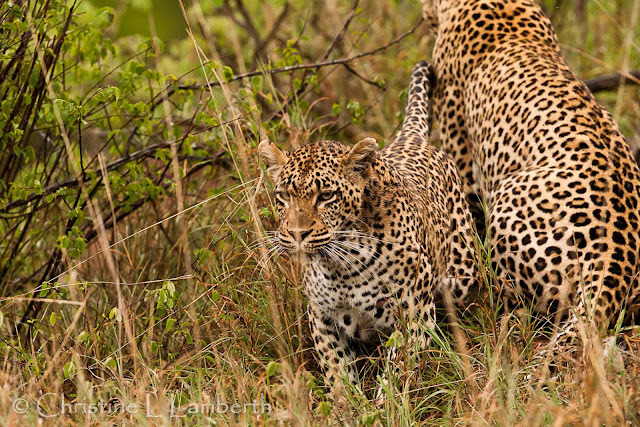 The female literally beats the poor male around the head with her tail and her demeanour is urgent. By now, of course, the light has faded and I am reluctant to suggest the use of spotlights. I prefer to watch the scene with as little impact as possible. As a result my images are grainy and the long grass does not improve the quality. 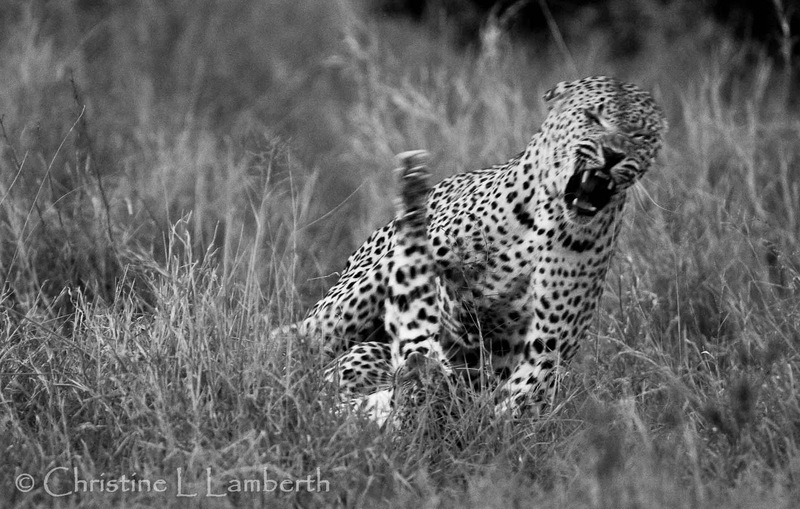 However, the thrill of seeing this animal interaction by far outstrips any images that I could have produced. We head off back to camp. What a day, my skin is tingling, my heart is singing and I can truly say that this is what Africa is all about. Spellbinding Stuff My Friend!